This 2-pack looks at 10-year & 30-year yields over the past 30-years. Both have remained inside of falling channel (A) over the past 25-years. The interest rate rally over the past two years has both of them testing 25-year falling resistance at each (1). A close-up view of each reflects that both hit channel resistance and are now attempting “rolling over” at each (2). Lower yields might not be a good sign for stocks and the banking index! Below looks at the bank index on a long and short-term time frame. 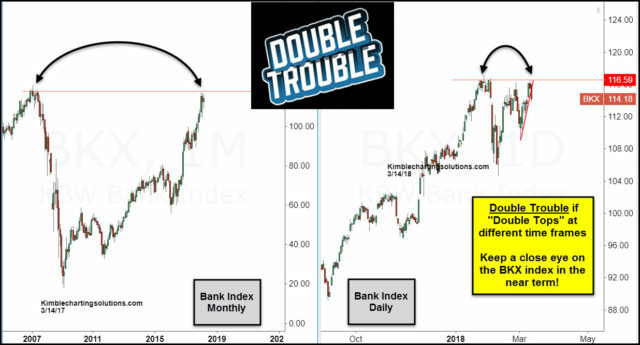 Keep a close eye on what banks do in the next couple of weeks. Could be “Double Trouble” for them if “Double Tops” are being created over different time windows!